TORONTO — Canada and film tax credits have been synonymous since the 1990s, offering a seemingly effortless way for producers to secure cost savings by making movies and TV series here. But this country’s tax credit swagger goes hand in hand with a web of lawyers, accountants and consultants working behind the scenes to help film and TV producers tap federal and provincial tax credits that aim to attract location shoots. 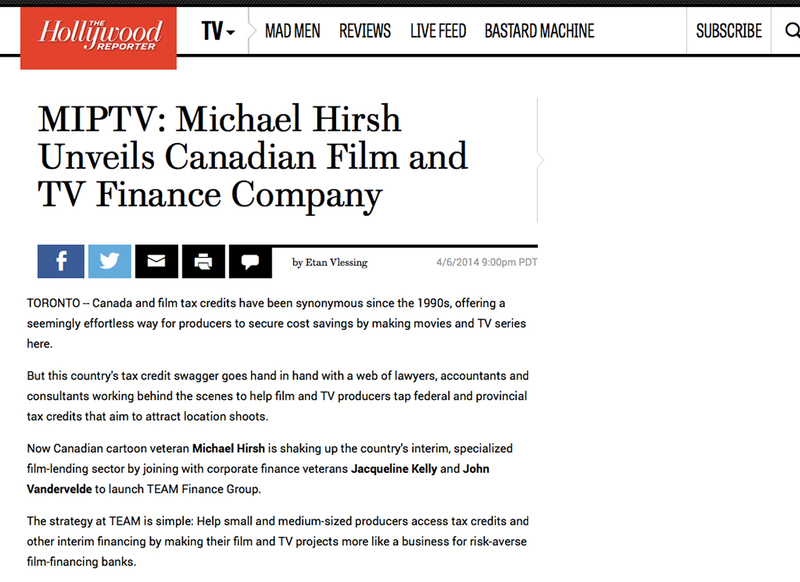 Now Canadian cartoon veteran Michael Hirsh is shaking up the country’s interim, specialized film-lending sector by joining with corporate finance veterans Jacqueline Kelly and John Vandervelde to launch TEAM Finance Group. The strategy at TEAM is simple: Help small and medium-sized producers access tax credits and other interim financing by making their film and TV projects more like a business for risk-averse film-financing banks. After all, virtually all Canadian film and TV productions exploit a raft of tax breaks and government grants, and that involves producers approaching financial institutions to secure bank loans to finance productions long before final tax credit filings. The key is making production companies bankable by bringing TEAM or another entertainment finance company into the picture. “The banks are looking at processing loans and knowing the projects are being managed from a back office point-of-view properly. So TEAM can provide that comfort and monitoring,” Hirsh toldThe Hollywood Reporter. Kelly and Vandervelde are both chartered accountants with long track records, greasing the skids for indie film and TV producers as they apply for tax credits, structure international co-productions or manage productions and loan monitoring. Vandervelde also worked with Hirsh at Nelvana and later Cookie Jar Entertainment, where he handled the acquisitions of Cinar Corp. in 2004 and DIC Entertainment in 2008. In 2012, Cookie Jar was acquired by DHX Media, a deal that made Hirsh chairman of the Halifax-based family content producer. Hirsh, Vandervelde and Kelly will be principals of Toronto-based TEAM. Canadian cartoon veteran Michael Hirsh is shaking up the country's interim, specialized film-lending sector by joining with corporate finance veterans Jacqueline Kelly and John Vandervelde to launch TEAM Finance Group.